It's Alt Good: How Alternative Text Can Upgrade Your Website | Infomedia, Inc.
Make your site more accessible, to both users and search engines, through easily adding alt text to your images. Working behind the scenes to catch Google’s attention can be a tricky task. From keywords integrated into blog posts to metadata that’s tucked away, the naked eye can’t always see how websites are communicating with search engines. While the main focus of any writing should be to communicate with readers, one key component that is often overlooked (due to being out of sight and out of mind) is alt text. An abbreviation for “alternative text,” alt text is a word or phrase tagged to an image within a website’s HTML. This is a helpful feature for visually impaired users whose screen readers will read out the written text and therefore make your image accessible to them. Along with upgrading your site to a more user-friendly place, alt text will also explain your image to Google and make the search engine take more notice of your website. 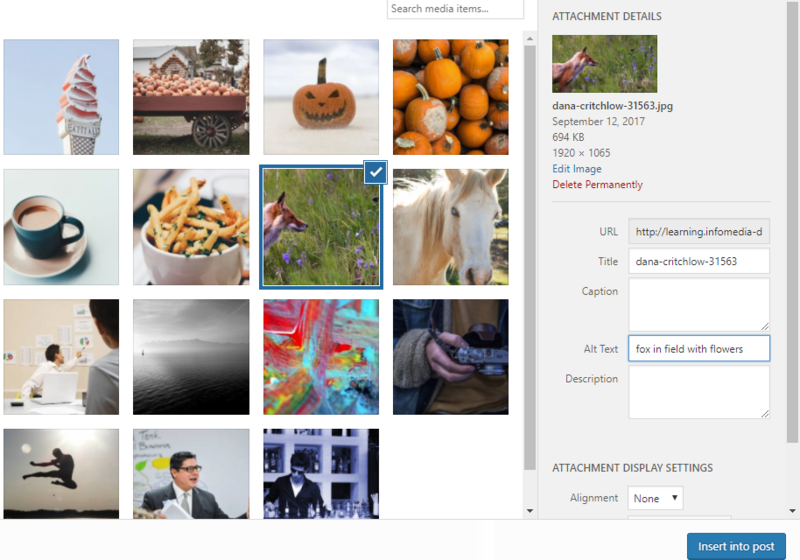 Once you’ve successfully uploaded a photo to your WordPress site, a sidebar titled “Attachment Details” will appear. This will have several blank fields for you to add extra information, including a section for alt text. Add your desired keywords (read below to see your best options) and then choose “insert into post.” Voila! You’ve now improved your site for both users and search engines. There is no magical alt text keyword that improves all sites. Instead, tag each image with appropriate words that make sense for the individual article and your brand. For example, “boy kicking soccer ball in field” is a lot more descriptive and solid than “Harry playing.” Five or more keywords is ideal, and never put hyphens in between words as this can throw off screen readers and search engines. Always write whole phrases, but don’t worry about capitalization or punctuation since those don’t matter for alt text. Also, as tempting as it may be, avoid keyword packing. Google doesn’t reward this tricky behavior and it can actually make your SEO worse. Ready to use helpful alt text keywords, but just lacking a great site worth promoting? Infomedia can help design one today to get your business booming. Contact us with your ideas and we’ll be happy to set you up with a free consultation.